The Everest Panorama Trek is specially very popular for people keen on witnessing the highest mountain on earth and having limited time or physical ability. It offers an insight to Sherpa lifestyle and culture, close-up and fabulous views of the world’s great peaks including the highest without the struggle with high altitude. Everest Panorama trek is best suited for those who do not have enough time for longer treks or do not want to take risk of high altitude sickness. 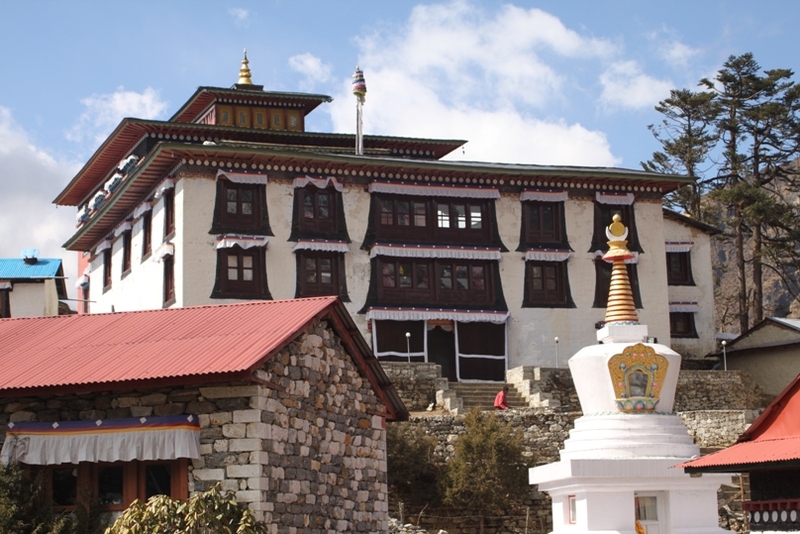 If you want to trek together with your family - with your elderly parents and little children, and want to see the mighty Everest up close, visit beautiful Sherpa villages, experience the Sherpa culture, visit the monasteries etc. this trek could be the perfect choice for you. Everest Panorama trek is a comparatively easy walk in the foothills of Mount Everest that starts with an exciting flight to Lukla enjoying the views of awe-inspiring Himalayan peaks. Then we trek into the Khumbu region - the Sherpaland, a region of ancient monasteries, Sherpa villages, high peaks and valleys in the shadow of the worlds greatest peak. Here, our stress-free week of trekking allows us to experience the unparalleled mountain scenery of the Khumbu, including the classic view of Mount Everest, Lhotse Shar, Ama Dablam, Thamsherku and several others. 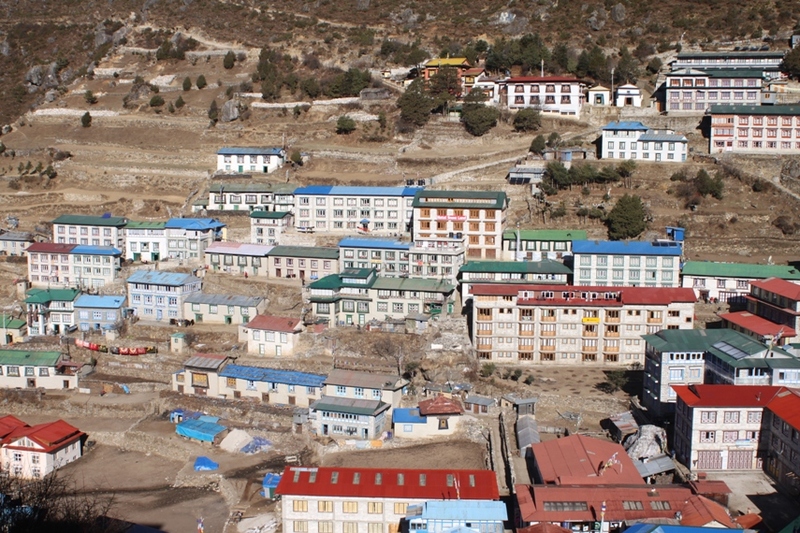 In this trip, you get to spend plentiful time in the delightful and scenic Sherpa villages where we get the opportunity to interact with the legendary Sherpa people and participate in their astonishing traditional lifestyle. Day 06Tengboche to Jorsale (2830m/9282ft) 6-7 hoursFrom Tengboche, a steep descent of about 1500ft/500m will take us through rhododendron bushes and fir trees to the Dudh Koshi River. We continue on our trail and pass Tashinga and Sansa villages before reaching Kyangjuma. 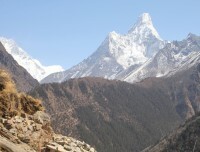 While here, we get to appreciate spectacular views of Ama-dablam, Thamserku, Nuptse, Lhotse and Everest. 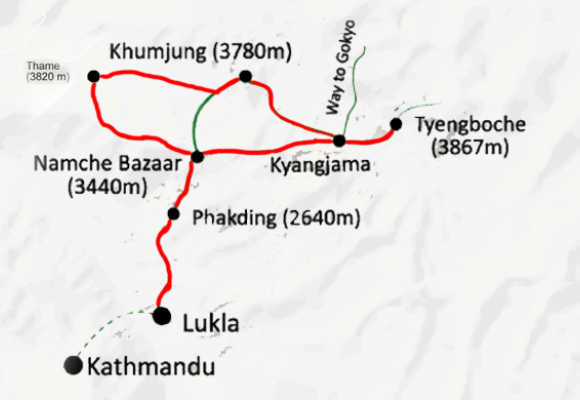 The trail clings to the steep wooded slope beyond Kyangjuma, winding through several bends. We keep an eye for wildlife such as mountain goats, snow leopards, colorful pheasants, etc. when passing through a forest trail. 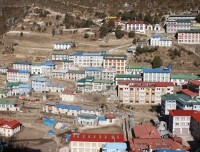 We reach Namche Bazaar for Lunch then continue to Jorsale. The trail clings to the steep wooded slope beyond Kyangjuma, winding through several bends. We keep an eye for wildlife such as mountain goats, snow leopards, colorful pheasants etc. when passing through the forest trail. A steep descent takes us to a bridge over the Dudh Koshi River. We cross the river twice at separate locations before reaching Jorsale. Day 07Jorsale to Lukla (2800m/9184ft) 5-6 hoursFrom Jorsale, after crossing the suspension bridge it's a short ascent to Monjo. Then trail descends steeply before it cuts up to the airstrip in Chauri Kharka. On the way we pass Phakding and Chiplung villages. 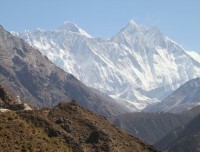 The climb from Chauri Kharka is the final climb of the trek. After our arrival in Lukla, we stretch those sore legs and recall the experiences of the last few days in the mountains. Today is last day of the trek in the mountains, so you celebrate your accomplishment together with the trekking crew. Day 08Fly back to Kathmandu (1335m/4379ft) 35 minutes flight/ Farewell dinner in a traditional restaurant with cultural programWe catch an early morning flight to Kathmandu after our long mountain journey. After reaching Kathmandu, we can take a rest or do some souvenir shopping. If we want to explore any other areas of Kathmandu, we may do that today. Our guides can help you with both souvenir shopping or sightseeing. Day 09Kathmandu valley sightseeing and Trekking preparation Today, we will visit three spots in Kathmandu valley of historical, cultural and religious importance which are also the UNESCO Wolrd Heritage Sites. We first visit Kathmandu Durbar Square, and observe old palaces, beautiful temples and have a quick glimpse of the Living Goddess “Kumari.” After exploring the historical, religious and cultural center on Kathmandu we will take short drive of about 20 minutes to the Swoyambhunath Stupa, which is popularly known as the Monkey’s Temple as many hundreds of monkeys hang around the temple and amuse the visitors. 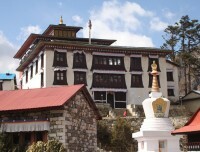 Monkey’s Temple is situated atop a hill which is believed to have self-existed and its hill top location provides great view down the city and also the Himalayas in a clear day. Then, we drive to another ancient town of Patan and explore its people and their art, culture, tradition and lifestyle. Observing beautifully decorated age old temples and monasteries, we may also have a chance to have a personal audience with the Patan Kumari (Living Goddess). Patan is famous for its temples, fine arts, metal works, stone & wood carvings. We can witness local artists working on their workshops. Patan used to be separate kingdom from Kathmandu and Bhaktapur and different kings ruled this ancient city until the 17th century. There has been little damages at the above sites by the recent earthquake but still beautiful and definitely worth a visit. The renovation is going on most of these sites. There will be a farewell dinner with Nepalese cultural program in the evening to celebrate the successful completion of our journey. In the evening, we go out for a traditional Nepalese dinner with cultural program. 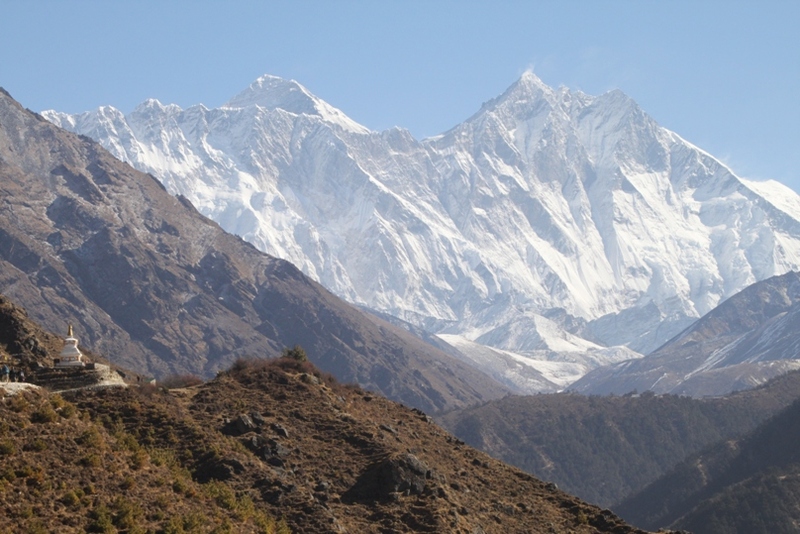 Everest Panorama Trek is a moderate trek suitable for passionate walkers who have the ability to walk at least 4 to 6 hours a day with a light rucksack. Walking in higher altitude is more physically demanding than walking in the lower altitudes; however, we only trek up to 3870m/12694ft. If we are in good health with average physical fitness, have a positive attitude and strong determination, we can accomplish the trek successfully. Exercising and jogging regularly is good idea to enhance our strength and stability. Past hiking experience would be an asset but no technical skill is required for this trip. Participants with pre-existing medical conditions such as heart, lung and blood diseases should inform Authentic Adventures before booking the trek. We also recommend that you consult your doctor before the trip.